10:14 a.m. Mervis Hall, 3950 Roberto Clemente Drive, Pittsburgh, PA 15260. Pitt police responded to the theft of two office chairs. An investigation is pending. 12:28 p.m. 51 Boundary St., Pittsburgh, PA 15213. Pitt police assisted city police with serving a warrant. Two actors were taken into custody. 1:32 a.m. Bates Street, Pittsburgh, PA 15213. Pitt police cited a non-affiliated person with disorderly conduct and public drunkenness. 9:48 a.m. Public Safety Building, 3412 Forbes Ave., Pittsburgh, PA 15213. Pitt police responded to a report of an individual receiving harrassing emails. An investigation is pending. 11:10 a.m. Public Safety Building, 3412 Forbes Ave., Pittsburgh, PA 15213. 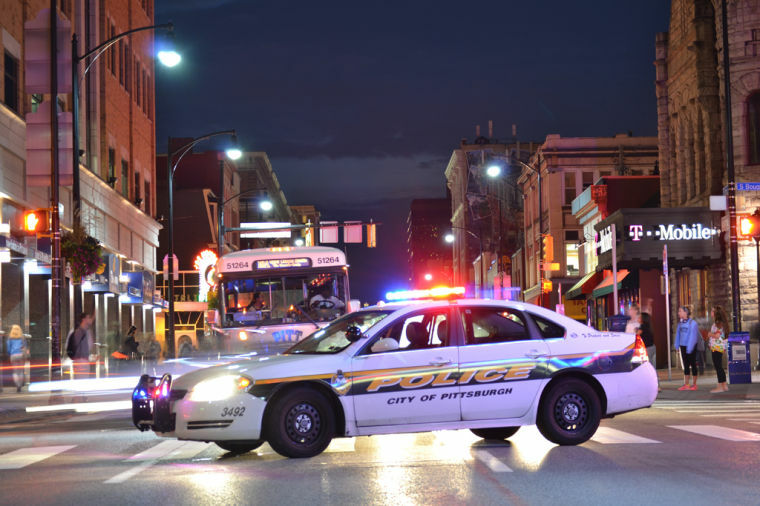 Pitt police assisted city police with judicial referrals. 2:41 p.m. Public Safety Building, 3412 Forbes Ave., Pittsburgh, PA 15213. Pitt police assisted city police with a fraud investigation. 10:26 p.m. 4000 block of Allequippa Street, Pittsburgh, PA 15213. Pitt police responded to a report of a criminal mischief. 12:21 a.m. Fifth Avenue and Bigelow Boulevard, Pittsburgh, PA 15213 Pitt police cited nine students for possessing or smoking a small amount of marijuana. 10:53 a.m. Petersen Events Center, 3719 Terrace St., Pittsburgh, PA 15261 Pitt police responded to a report of a burglary. An investigation is pending. 12:05 p.m. Trees Hall 140 Allequippa St., Pittsburgh, PA 15261. Pitt police responded to a report of a missing cellphone and money from a locker. An investigation is pending. 12:52 p.m. Petersen Events Center, 3719 Terrace St., Pittsburgh, PA 15261. Pitt police responded to a report of a theft. An investigation is pending. 1:24 p.m. Scaife Hall, 3550 Terrace St., Pittsburgh, PA 15261. Pitt police assisted UPMC security with a theft report. 11:15 p.m. Petersen Sports Complex, 365 Robinson St. Ext., Pittsburgh, PA 15219. Pitt police assisted city police with a foot pursuit of a warrant suspect. The actor was located and taken into custody. 2:04 a.m. Bates Street, Pittsburgh, PA 15213 Pitt police assisted city police with a disorderly conduct. Two students were referred for judicial action. 4:40 a.m. Litchfield Tower A, 3990 Fifth Ave., Pittsburgh, PA 15213. Pitt police responded to a smell of marijuana. One student was referred for judicial action. 2:12 p.m. 200 block of Coltart Ave., Pittsburgh, PA 15213. Pitt police assisted city police with a drug overdose. 3:31 p.m. 3900 Forbes Ave., Pittsburgh, PA 15213. Pitt police responded to a bicycle theft. An investigation is pending. 12:21 a.m. Sutherland Hall 3725 Sutherland Drive, Pittsburgh, PA 15213. Pitt police responded to a report of a drug law violation. One student was referred for judicial action. 3:25 p.m. Pennsylvania Hall 3825 University Drive C Pittsburgh, PA 15213. Pitt police responded to a report of a criminal mischief. An investigation is pending. 6:24 p.m. Forbes Ave. and Atwood St., Pittsburgh, PA 15213. Pitt police cited a non-affiliated person for public drunkenness. 11:53 p.m. 200 block of Atwood St., Pittsburgh, PA 15213. Pitt police cited a student for public urination. 1:49 a.m. Boulevard of the Allies and Halkett Street, Pittsburgh, PA 15213. Pitt police arrested a non-affiliated person on charges of driving under the influence.